AUTHENTIC AMERICA ON THE MIGHTY MISSISSIPPI - Have you ever wondered what this country looked like to its early explorers and pioneers? 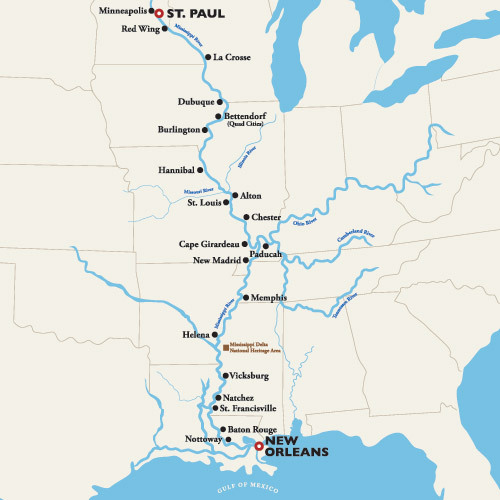 Traveling on the Mississippi and its tributaries aboard the grand American Duchess, you will be transported back in time to an era of leisurely and romantic travel. Storybook American towns and vibrant, bustling cities provide a bit of excitement between peaceful fields of gold, majestic panoramas and high bluffs. Authentic America is out there just waiting to be explored and after three fabulous weeks cruising amidst the Antebellum charms and gracious style of the American Duchess, you will forever be changed.